From slow-cooked stews and quick stir-frys to paellas and pilafs, the spectacular array of dishes in this cookbook will serve you through the seasons. No matter what you are in the mood for—comforting casseroles, braised meats, creamy chowders, frittatas and risottos, hearty pot pies, cheesy gratins, baked pastas, or spicy gumbos, curries and tagines—you'll find an enticing meal that can be made or presented all in one vessel. Endlessly versatile and easy to prepare, one-pot meals are the ideal solution to what’s for dinner. Whether it’s slow-cooked short ribs, a hearty casserole, or a healthy stir-fry bursting with seasonal vegetables, the collection of main course recipes found in this book will provide inspiration throughout the year. Fresh spring vegetables, like sugar snap peas, leeks, and tender asparagus bring new life to baked pastas, creamy risottos, and fluffy frittatas. In summer, the garden bounty stars in lighter fare like braised meat dishes with diverse flavors, roasted and stir-fried seafood, stratas, and enchiladas. In autumn, root vegetables take a leading role in pot roasts, gratins, and rustic tarts while classic comfort foods, such as meat loaf and baked ziti with sausage, are back-to-school favorites. Rich and savory dishes like meat pies, fall-off-the-bone lamb tagines, spicy curries, herbed cassoulets, and warming stews feed a crowd and keep winter’s chill away. 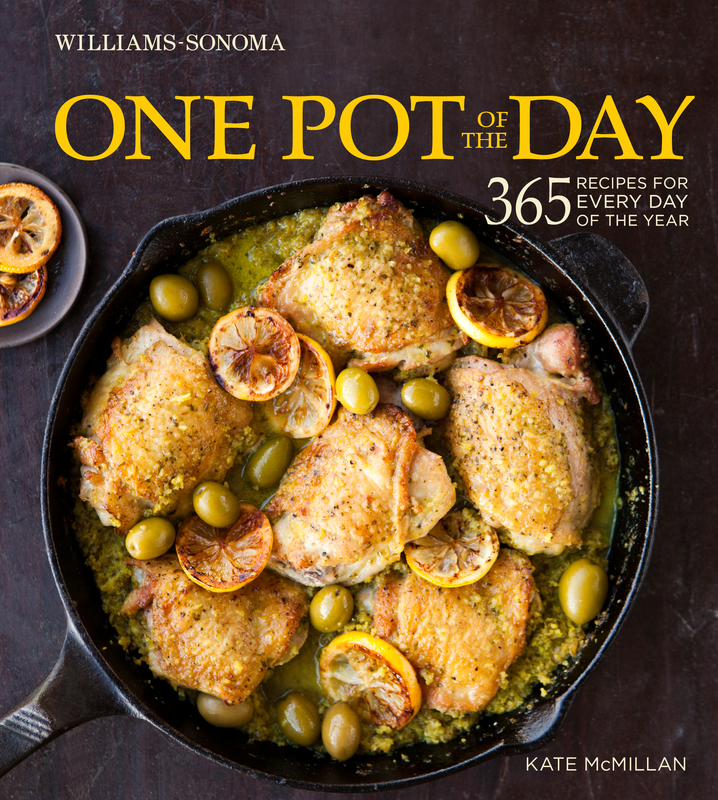 Williams-Sonoma One Pot of the Day offers 365 recipes for delicious, seasonal food that is made or finished in one pot, including many meatless and oven-to-table selections. Colorful calendars at the beginning of each chapter offer an at-a-glance view of the dishes best suited for the ingredients, occasions, and typical weather of the month. From January to December, you’ll find a variety of one-pot dishes to satisfy any craving and suit any meal, with accompanying notes offering ideas for variations, garnishes, and other tips. With this comprehensive book as your guide, you’ll discover an enticing recipe for every day of the year. Full-color photographs enhance many of the recipes to help guide your cooking. You’ll be amazed at the wide range of dishes from which to choose—just open this book, check the calendar, and discover an exciting new one-pot dish to try.